First Congregational Church purchased the neighboring bank property in late 2016, to turn the once vacant drive-through and cracked asphalt into a green space and community asset. The bank building now features an elevated stage approximately 27×14 feet, facing a concrete patio and an open park-like courtyard. Benches and colorful trees surround a large lawn, and the featured labyrinth. A flower garden, colorful art projects, and memorials complete the space. 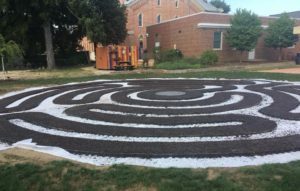 We have already hosted several events and fundraisers at this space, and we welcome visitors to explore our labyrinth or contemplate life on one of our benches. We are also happy to accomodate larger groups, to host your event or celebration as well. Please feel free to contact us at commons@ucccharlotte.org for more information. 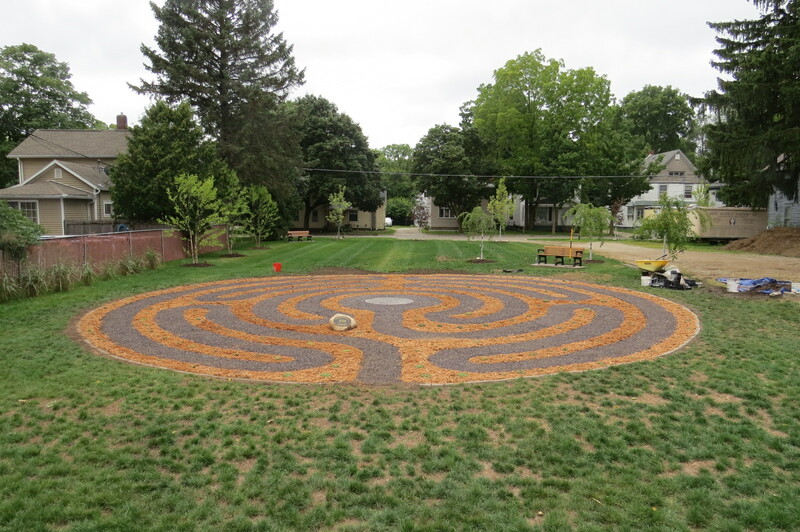 The Commons labyrinth measures 45′ across, and is based on the Chelsea 5-circuit design using a template from The Labyrinth Company in Kensington, CT. The path is 24″ wide and constructed of a bonded rubber mulch from American Modern Landscape, that is both soft and durable. The border between the paths is a 16″ gap, that contains soft groundcover plants (Sedum Hispanicum) and mulch. A 4′ concrete medallion in the center is stamped with a colored lotus flower, symbolizing spiritual awakening and enlightenment. The walking distance of the labyrinth from start to finish is 871′, which is about 350 steps or 1/6 of a mile. Embedded in the walking path are many small glow stones. After a bright sunny day, these will glow softly for a few hours, providing a “galaxy effect” of stars against the dark path material. 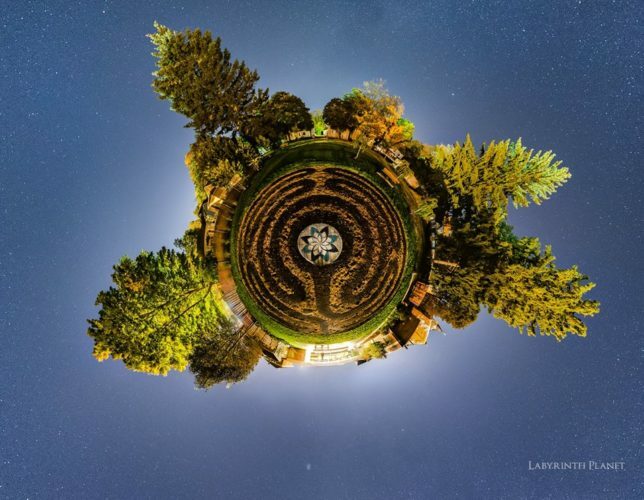 We are also registered with the Worldwide Labyrinth Locator. Click here for more information on the history of labyrinths. Click here to browse more.